The convenient paint cups for efficient working. This disposable Paint Cup ensures you a fast and error-free job. The cup shows the most common mixing ratios at a glance, mixing scales in millilitres and fluid ounces, is available in four different sizes and the flat bottom ensures complete processing of your paint. The paint cups can be easily stacked, are solvent-resistant and antistatic. 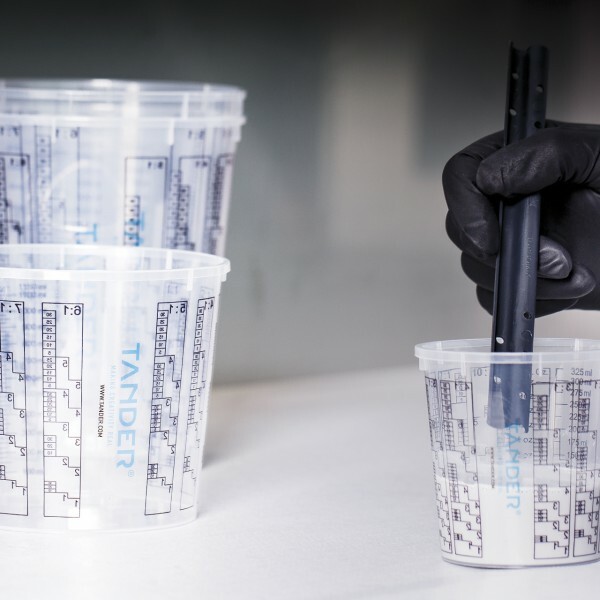 Tander Paint Cups - it’s all in the mix.Craftsmen know this better than anyone. Use the printed mixing scales to achieve the correct mixing ratio. Am I able to store left-over paint? Yes, we offer a matching Paint Cup Lid for all Paint Cups. These lids seal air-tight and keep leftovers clean. Always consult your paint supplier concerning the shelf life of leftovers and the storage advice. Are all Paint Cups applicable with the Paint Application System? No, not for the 1400 ml and 2300 ml. We offer the Paint Application system in a 350 ml and 700 ml version. We feel that these versions cover the larger and spot repair jobs perfectly. How do I keep my Paint Cups dust-free? All Paint Cups are sealed in practical, plastic bags. We advise to keep them sealed as long as possible and to open them on the bottom side. This way you store your Paint Cups topsy-turvy and dust doesn’t have a chance to get inside the cup.